I looked around the hall and shook my head. I knew it myself. That I beamed satisfaction and smugness. It was to be expected. An assembly of women with a stray male, thrown in here and there, to break the monotony. For hasn’t Fay Weldon been anointed feminism’s High Priestess? Or, was the draw that she wrote books that, despite the sometimes oppressive burden of their sub texts, make a great read? 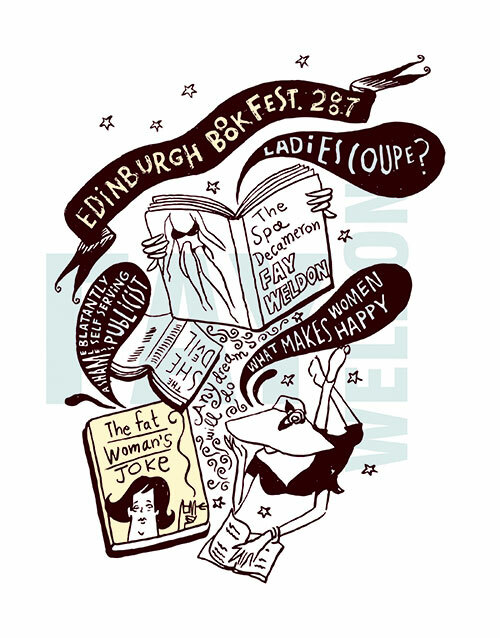 This was the Edinburgh book festival 2007. A wet blustery August day where the only warm spot seemed to be the ‘Authors Yurt’. A commodious tent within which rugs and cushions, wine and coffee, biscuits and nibbles, a computer with an internet connection, writers, agents and publishers milled as they awaited their turn. I wrapped my palms around a mug of coffee and huddled in a corner. In the middle of the ‘Authors Yurt’, Fay Weldon stood in a dazzling multicoloured coat. For a moment, a ghost of a smile nudged at my lips. Joseph and his technicolour coat. And from the Rice-Webber musical, a chorus sang in my head: ‘I closed my eyes, drew back the curtain / To see for certain what I thought I knew.’ Strangely enough, I came to Fay Weldon through the movies. So there I was in the winter of ’91, sunk in an abyss I couldn’t raise myself from. The medical profession has a name for it: postpartum blues. They advocate mood elevators in shapes and sizes. In my case, I sought solace in the daily offerings of my videowallah. In that particular frame of mind, the Life and Times of the She-Devil seemed an appropriate enough choice. I wanted to be able to howl alongside one other person who felt like I did then – fat, frumpish and decidedly unhappy. The movie was fun yet the moment of truth for me wasn’t when the enraged wife blew up the house or packed her brats off to her husband’s love nest. For me, it was the scene when the wife, who has been singularly unsuccessful in winning over the head ‘carer’ in the old age home, tries a final ploy. She opens a box of pastries in front of her. One by one, the wife chews stolidly through the cakes and the iron faced ‘carer’ crumbles in slow motion. With a manic gleam, the head ‘carer’ seizes the box and drags it towards her with a rapacious greed. In that moment, I had a new literary icon. It didn’t occur to me that the scene could have been written in by the scriptwriters. (And for the life of me, I can’t remember now if that scene exists in the book.) But it was enough. It was the essence of the book. It was a Fay Weldon flash – an ‘any dream will do’ kind of a distillation of the human spirit. So, as I sit there amidst a sea of women, who are mostly loyal fans and ardent Weldonites, I begin to wonder if they as I have, have begun to feel that slow disenchantment. Has that slightly skewed world we inhabit taken its toll? That her more recent books seem corroded with a bitterness that is galling; that what was ‘unputdownable’ about her is now off putting. Then Fay speaks. (Next day at a literary lunch, with true literary establishment bitchiness, someone tells me, “Fay Weldon is a shameless, blatantly self-serving publicist of her own work.” It puts me off my pasta but not Fay Weldon.) For after Fay spoke, she read. And as Fay read I think that all is forgiven: ‘My name is Phoebe Fox, I am a woman of a certain age, and blondish. My roots needed doing and I wanted extra streaks. I had to have somewhere to go, as a matter of urgency. And wherever I was going I had to get there with good hair.’ Any person who can write that can even be excused writing a ‘I was once married to an axe murderer’ sort of puerile nonsense. But this was Fay Weldon. And in her element: of women confused, groping and desperately seeking a place of their own. The Spa Decameron, her most recent novel, is about a gathering of high-achieving ladies, at the remote and expensive Castle Spa, over the ten days of Christmas and New Year. None of them have met before. We are all sitting around a table in a restaurant. I am quite content to look at her. When I meet someone whom I have admired from afar, I do not know what to say to him or her. I am quite happy to be there watching and no more…. So when someone pointed out to Fay Weldon, “We were just saying how much the Spa Decameron reminds us of Ladies Coupe”, I almost choked in embarrassment…while Fay wore a smile that was beginning to wear at the edges. The poor woman had just performed in front of an appreciative but equally critical audience. She had signed copies, smiled at strangers, endured inanities and banalities and now as she sat sipping a well-deserved glass of red, she was being told that she had written a book that was like another. Which writer can stomach that? I didn’t think Fay Weldon cared for that moment. Neither did I. For in a world so deficient in literary deities, I wanted my icon where she belonged. On her pedestal. With her technicolour dream coat flashing strains of ‘any dream will do’.